YFMD Automatic Laminating Machine apply to the equipment complex of BOPP thermal lamination film and paper. 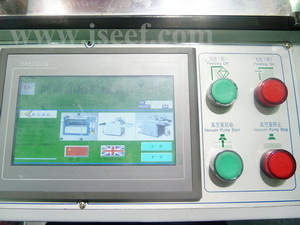 It is consisted of auto feeding system,positioning, laminating system,auto breaking and auto picker collector. It is a new type of after-print laminating machine, The machine centralizes the features of compact structure, high automation, humanized operation design. Box,etc. It is an excellent choice for printing and packaging factory, professional after-print laminating factroy and so on. Which can improve printing quality and decrease the technical cost. BOPP or non-glue plastic film convey from release air shaft , through the convey roller and curved roller, in the meanwhile automatic conveyor automatically sent paper to laminating machine host. It adopts heating roller and pressure way to laminating bopp film and non-glue film on paper. Heating roll adopts oil circulation heating system to homogenize and stabilize laminating temperature. The laminated goods will be auto breaking and then to automatic picker collector to finish collecting. The electric and pneumatic devices are controlled by programmable control system(PLC), main components adopts international brands, need one person to operate. User only need to input processing paper size on the text screen, then can achieve film laminating and paper slitting. The equipment is very suitable for large size laminating companies .